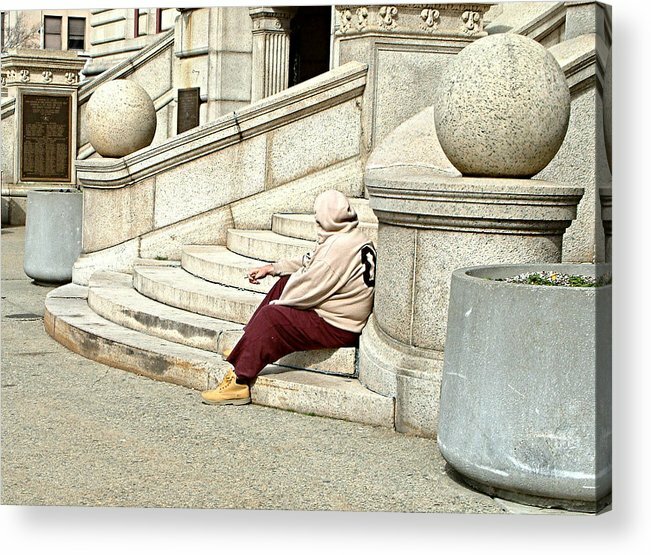 Resting On The Steps Of City Hall by Mike McCool - 10.000" x 7.375"
Resting On The Steps Of City Hall acrylic print by Mike McCool. Bring your artwork to life with the stylish lines and added depth of an acrylic print. Your image gets printed directly onto the back of a 1/4" thick sheet of clear acrylic. The high gloss of the acrylic sheet complements the rich colors of any image to produce stunning results. Two different mounting options are available, see below. 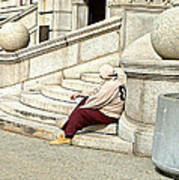 There are no comments for Resting On The Steps Of City Hall. Click here to post the first comment. 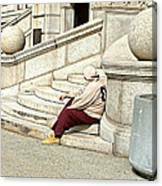 This was taken in spring 2012 outside City Hall, Worcester, ma. It shows a man resting, possibly waiting for a bus. 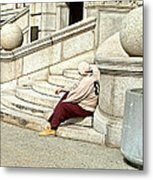 I like the contrast between the shape of his head and the stone balls either side of the steps. I currently reside in Millbury, Massachusetts, USA. I was born in England but have spent more than half my life outside the country working in various interesting places around the world. I have been photographing items of interest since early childhood but my interest faded for a number of years until I discovered digital photography about ten years ago. My work now consists of exploring the world of digital photography and digitizing and rediscovering my horde of 35mm and 2 1/4 square negatives. My work has become more abstract over the years often with the original image, sometimes an old negative, being a springboard to extreme reprocessing using Serif's PhotoPlus X8 and Affinity Photo.